Who's ready for daytime basketball! I'll let you behind the curtain, just a little bit. With the exception of March basketball, my favorite part of the college basketball season is in November when all of the holiday tournaments take place. Chief reason for this is daytime basketball. I think my love for it stems from when I was a kid and my father would let me take a day or two off from school prior to Thanksgiving to watch the Maui Invitational or one of the other tournaments. As an adult, it's taking a long lunch or taking a full day off from work to enjoy a day of hoops, surrounded by an assortment of finger foods and cold beverages. Come to think of it, that's probably what I love most about March basketball too. Anyway, daytime basketball is great regardless of the month. Alabama will travel to Charleston for the aptly named Charleston Classic. Including Alabama, the tournament features five teams that made the NCAA tournament last season, Bama's previous opponent (Appalachian State), and two teams - Northeastern and Ball State - that are expected to contend for their league titles. The first opponent for Alabama will be Northeastern (KenPom: 79). The Huskies are the preseason favorite in the Colonial Athletic Association (CAA). They enter this game 1-1. Game time is 1 P.M. CT. The game will be televised on ESPNU. This will be a big weekend for our guys from a resume standpoint. To insure they put themselves in the best possible spot for resume opportunities, they need to win this game. And this game itself won't be a slouch from a resume standpoint. If Northeastern goes on to have the season many expect them to, a win on Thursday could rate as high as a quad 2 win come March. My Two Cents: Avery mentioned something in his postgame press conference following the last game that stuck with me. He said that the App State game was the type of game they would have lost last season. He thought the team finishing strong after falling behind by six in the second half was a sign of maturity. Avery has a flair for hyperbole (the team last season won its share of close games against good mid-major opponents in November), but I was impressed with the team's ability to not allow a poor shooting night to affect them on the defensive end. If anything, they got better on that end as the game progressed. And there was no doubt who the more physical team was. They'll need to remain mature on Thursday. Northeastern is similar to App State in that they are a veteran team (the top five scorers from last season return) with a talented backcourt. The Huskies are currently ranked in the top 50 at KenPom in offensive efficiency, but play at a slow pace. On the flip side: Alabama is top 50 at KenPom in defensive efficiency. Due to the slow pace that Northeastern plays at, the last thing Alabama wants to do in this game is allow the Huskies to control the tempo and turn this game into a halfcourt rock fight because I'm not convinced yet that this Alabama team can consistently produce offense in the halfcourt. Players to Watch: Kira Lewis has been more than a pleasant surprise so far this season. In my opinion, he's been one of the top three players on the team so far. It's a long season and we'll see how Kira handles the grind of it all, but he's been incredibly poised for a 17 year old freshman who didn't even go through the summer program. This weekend he will see the competition level go up, plus this will be his first games outside of Coleman. 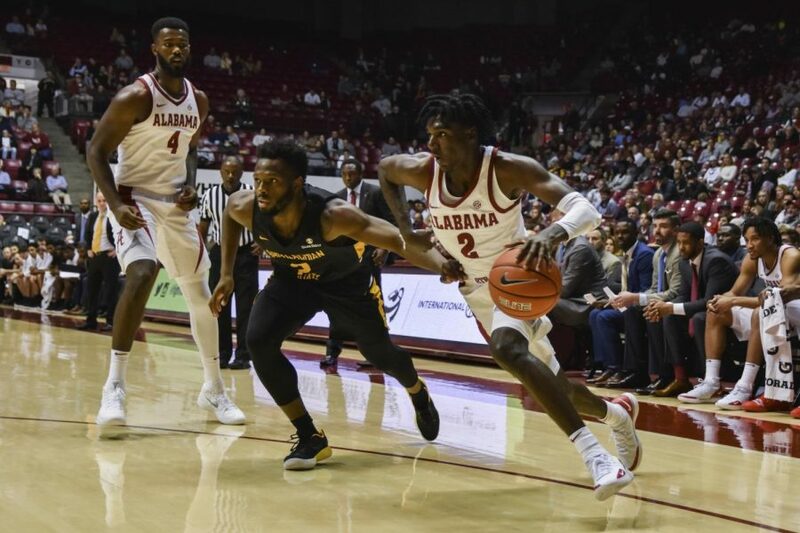 Assuming he is the starting point guard moving forward, how he handles things in Charleston could go a long way towards determining if Alabama's playing for the trophy on Sunday. After facing a veteran, talented backcourt this past Sunday, Alabama will have to do it all over again. Vasa Pusica and Jordan Roland, a transfer from George Washington, are averaging a combined 41.5 ppg, 4 rpg, 6.5 apg and 2.5 spg. Roland has been deadly from three so far this season, knocking down 47.1% of his shots. Both guys also cash in at the free throw line, with Roland knocking down 90.9% of his shots, and Pusica making 82.4% of his attempts. In the two games so far, one guy has had the big game, while the other has had modest numbers. If both of these guys are playing well on Thursday, we're probably not going to like the end result. Prediction: I think our guys are in for another battle on Thursday. Northeastern is experienced, well-coached, and likely settled as a team in terms of team roles simply because it's more or less the same team as they had last season, with the exception of Roland who appears to have fit in just fine. Meanwhile, I think Alabama is still trying to figure some things out. Point guard looks clearer than it did two weeks ago, but I'm still not sold on the big starting line-up, and I think the roles for this team are still being settled. That said, if Alabama brings their defense to Charleston, I think they're simply the more talented team in this game. Hopefully, that will be enough to advance them to the winner's side of the bracket.